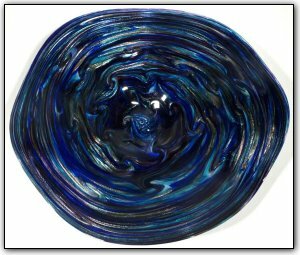 This sparking wall bowl features many shades of blues and purples swirling throughout. This wallbowl also has real gold adventurine within the swirls creating a truly magnificent one of a kind piece. Make sure to zoom in and see the sparkles and all of the intricate patters. And the neatest thing is that the more light you shine on this piece... the more it sparkles!